Leadership is not taught — if Dartmouth wants leaders, it needs causes. It is apparent why Dartmouth believes graduating leaders is both desirable and a decent rallying cry for raising capital. What is not so apparent is whether Dartmouth has given any thought toward how leaders are created. If the College’s current programs are any indicator, this four-year cocurricular strategy will be no more than a curious peak in the local Panera Bread’s quarterly earnings graph (the author holds no grudge against catered food, though Panera’s chips are hard to get out of one’s teeth). Averting this catastrophe requires an exploration of leadership — and not the kind that one earns via certificate. Those interested in generating “leadership” need to understand how to identify potential leaders and how to nurture them. Leadership is a primal behavior. Forming groups keeps humans alive, but doing so introduces a problem of conflicting preferences and desires. Without a single point of direction, a group’s incoherent interests can tear it apart. Therefore, groups with a leader (often called a dominance hierarchy) tend to do better as a whole. (It’s worth noting that this is only a problem for non-eusocial animals — if this was a Call to the Hive Mind we would be having a far more entertaining debate about President Hanlon’s qualifications as Queen Mother (mustache plus, lack of egg-laying minus)). As an animal behavior, leadership has a heritable genetic component. Well-regarded twin studies that compare identical twins and fraternal twins identify that genetics determine up to 30 percent of leadership role occupancy likelihood (while simply occupying a leadership position doesn’t make one Churchill, it’s a start). Large population variance in predisposition for leadership implies that mandatory leadership education for all is a waste of time. By definition, we’re not all cut out for it. However, just as important is understanding that it’s likely impossible to reliably pick out leaders from the crowd. Dartmouth has no place attempting to select who has potential and who doesn’t. The short answer to our initial question is that you can’t identify potential leaders — but you almost certainly can’t just treat the entire student body as if we all have the right stuff (the author lays no claim to any stuff, much less the right type). Luckily, one doesn’t have to be able to identify leaders to nurture them. Leadership is an emergent quality. Leaders emerge out of need for leadership, and they ascend to their positions not out of want, but out of the recognition that it’s best for the group. They are elected on the sheer admiration of their peers. They are deeply knowledgeable about their domain. They commit many hours to their craft. I know this because I’ve seen it happen. The DOC sub-clubs are likely the finest example of this (the author holds no leadership position in any DOC sub-club outside of those he has created for himself, namely the Enthusiasm Chair of the Biathlon Club). All these clubs feature dedicated members, constant interaction amongst members, an appreciation for talent and knowledge and well-respected, competent elected leadership. I also know of excellent counterexamples: any leadership position earned via application that was then approved by a committee is bogus. Election by application attracts those who desire leadership for its status. I fear the College’s focus on graduating leaders has encouraged this position-seeking, offering up a platter of Potemkin positions for resume puffers to gorge themselves on. 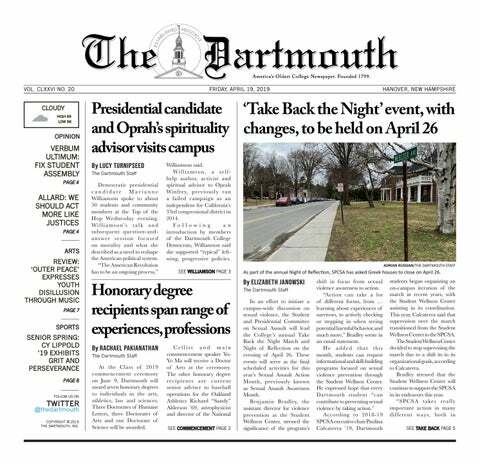 If, then, leaders arise where needed, how can the Dartmouth community nurture these leaders? It is simple: let them lead. It stands beyond all doubt that the best way to train leaders is to allow for well-resourced, self-governed student organizations. The more the administration makes decisions for students, the less need there is for student leaders. The more powerful student organizations are and the harder the decisions that need to be made, the greater the need for truly outstanding leaders. A single cent of this capital campaign spent on leadership training sessions is a waste. Instead, ask great things of students: fund a club dedicated to combating food insecurity, celebrate student activism, offer up housing to an ambitious new student social group or give students domain over some aspect of running the college. Do this and leaders will rise to the occasion. A “Call to Lead” is a misnomer; leaders do not exist outside of efforts they direct. It’s misleading to think of leaders as if they can be cultivated like carrots from the Organic Farm (an excellent example of student ownership). If we want leaders, we need causes. A Call to Action is more apt. From worthy causes rise committed student groups — and from committed student groups rise leaders.